But then come to this one and I'm like, dang. Sweet damn. I'm honored, grateful and proud. Thank you, everybody! Also, on page 12 of the doc, AE is the Preferred System of the listeners of 3 different shows in the top 20 (plurality in this case). And thanks for blogging it! Also this obviously isn't just me. Congratulations, Adam, Sage, Joe, Michael, Sean, Marshall! 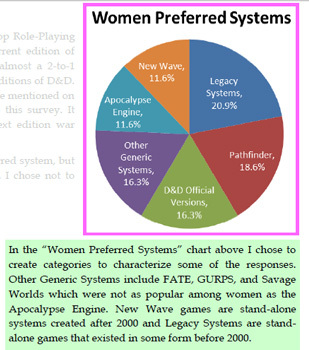 Could you give us a further breakdown of the AE section of the "Women Preferred Systems" chart? No problem! 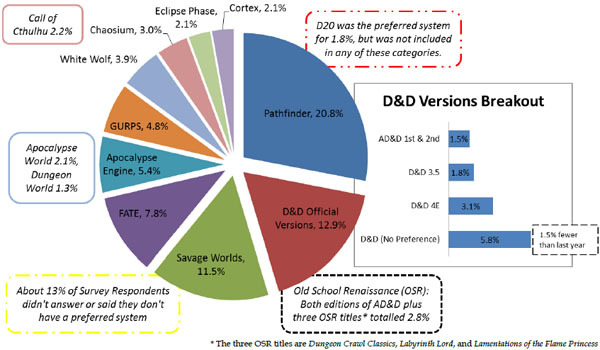 4.7% of women said Apocalypse Engine, 4.7% Dungeon World, and 2.3% Monster Hearts. Take into account that our female sample is pretty small and that's why there's a lot of consolidation and a 10% minimum in that chart. Is "Apocalypse Engine" the new official title? Interesting breakout. I wonder if that just reflects Apocalypse and Dungeon Worlds' greater popularity. The stereotype would be that more women prefer Monsterhearts, but I've played with enough men who played overtly sexual characters to doubt that there's much of a disparity. Ben, that stereotype about Monsterhearts may be true anyway, but only in the sense that gender balance at MH tables is more likely to be even, IME. But I think that depends more on the local gaming culture.